Let’s go on a little adventure today! What do you say? Many of you already have snow on the ground so it’s not a stretch to start thinking about cranking up the Christmas tunes and firing up the oven slow cooker to so some amazing holiday baking. That’s right. I said slow cooker! Why not? 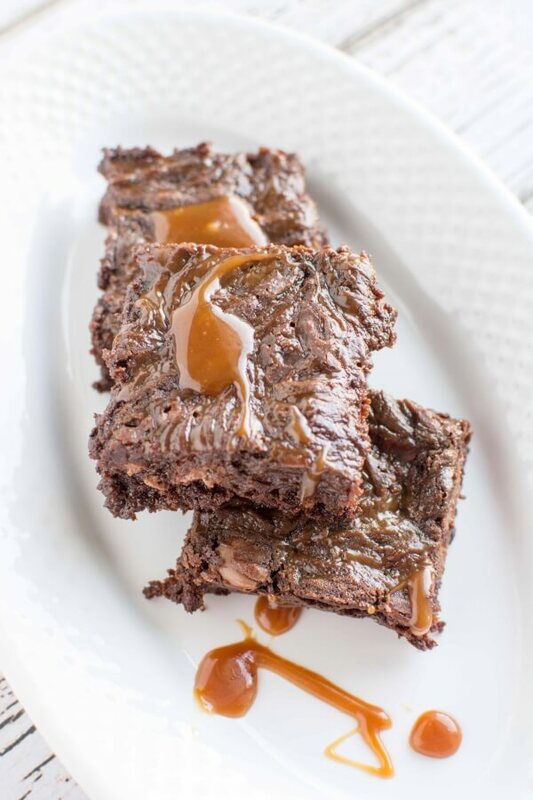 It’s a great way to make up, say, a big batch of delicious Triple Chocolate Salted Caramel Brownies without having to babysit the oven. So grab your eggnog and let’s get this adventure started! Is there anything better than homemade treats? Me and my kids love to make a list and get to baking some special desserts that we can share with our friends and family. It’s one of the few times a year I tend to do much baking…(err….. slow baking?) and I like to put a little extra effort into making this totally from scratch when possible. 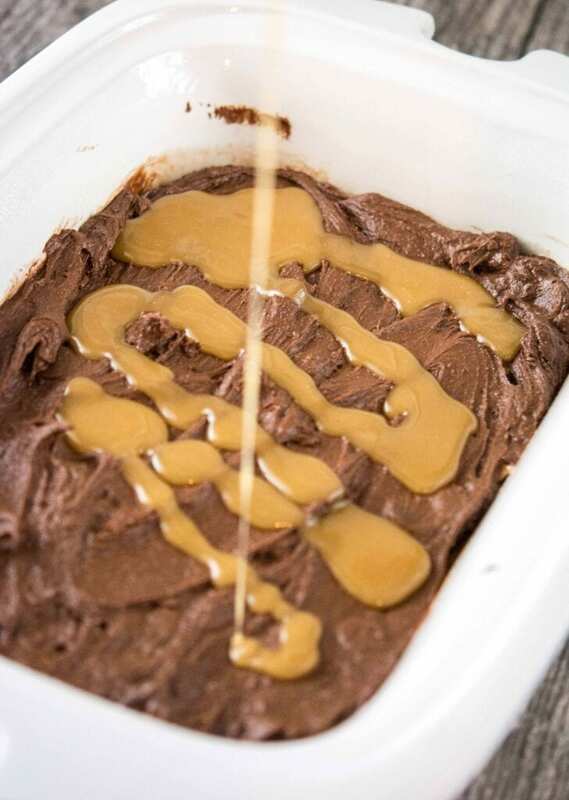 For this recipe, that even includes making our own salted caramel sauce. Don’t worry, this one is simple. Just 4 ingredients and less than 10 minutes from start to finish. Let’s have a little chat about our triple chocolate deal we’ve got going on. The first is some semi-sweet chips that we will melt with a little butter in the microwave to give the brownies a super chocolatey base. Of course we won’t stop there. 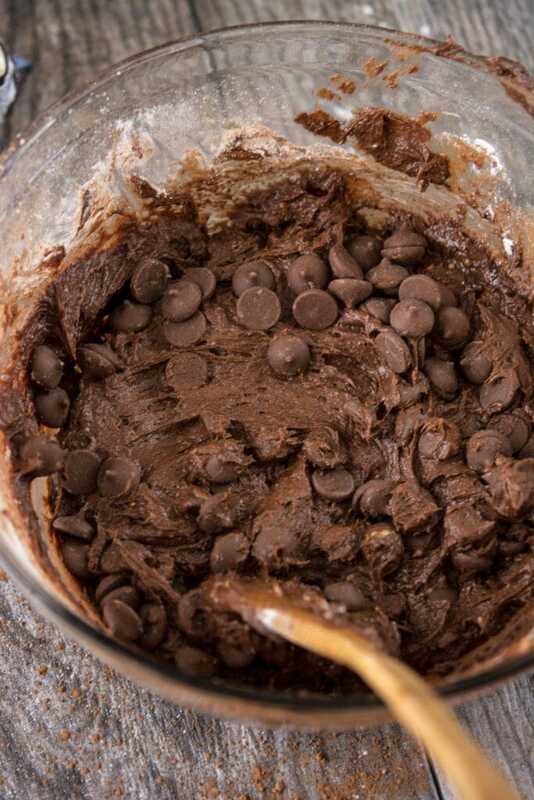 We will also add some chocolate baking powder AND of course some milk chocolate chips. 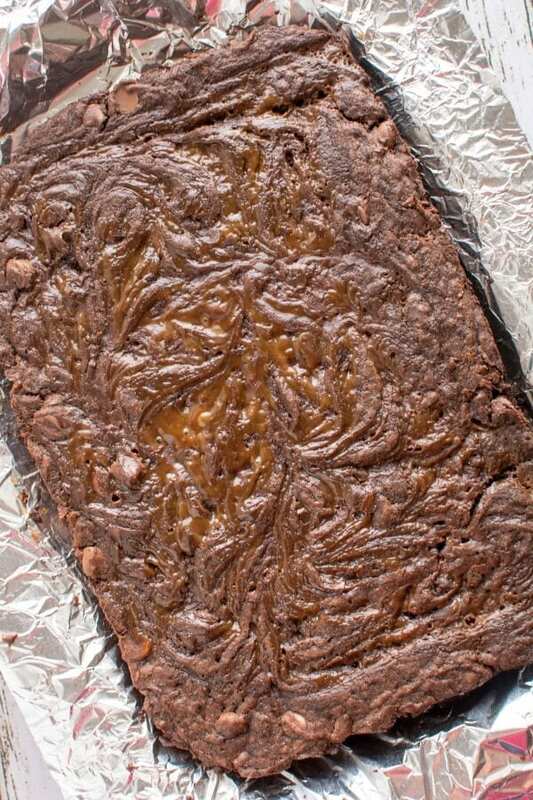 Because brownies aren’t really brownies without that little extra burst of chocolate. 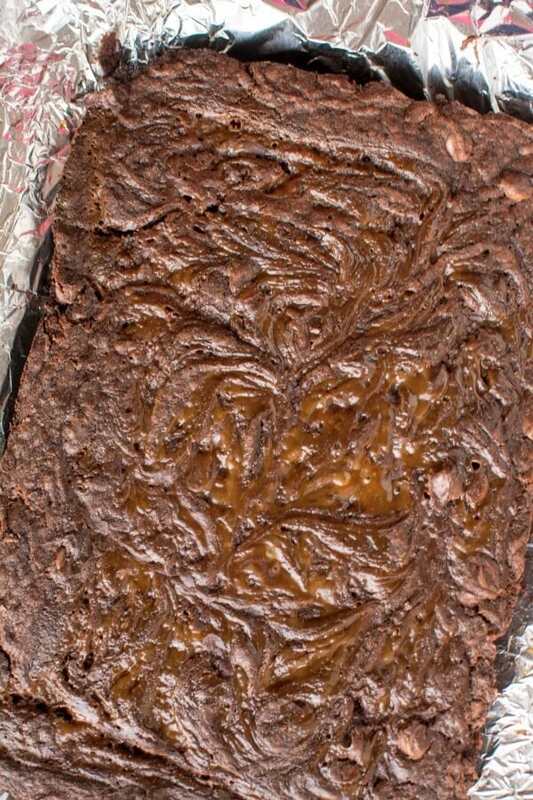 We are going to mix this all up with your basic brownie ingredients using a simple one bowl method and a wooden spoon. Nice right? No big messes to clean up. So let’s chat about those basic ingredients for bit! We’ve got eggs, sugar, vanilla, baking powder and salt. Plus, of course, we’ve got to have flour. Make sure you use a good quality flour here, like Bob’s Red Mill (like coupons? grab one here). Truly, this kitchen staple is incredibly versatile and perfect for all of your baking needs. Or slow cooked baking needs, however you look at it ? 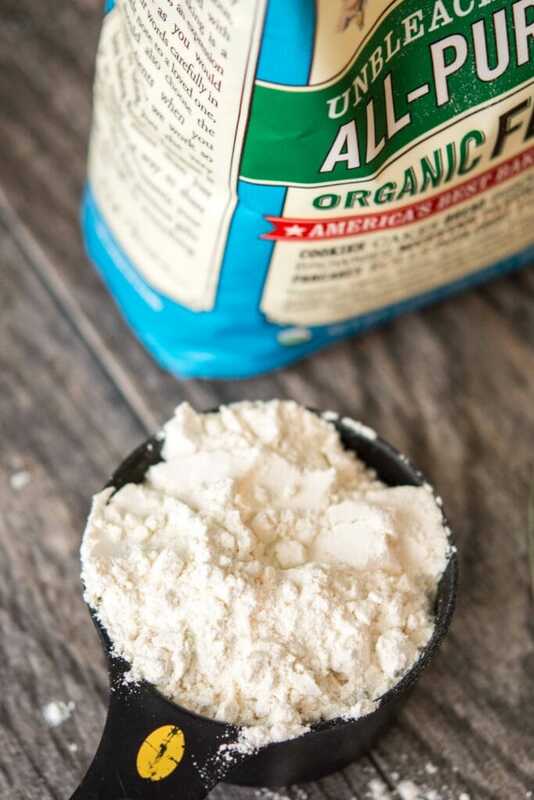 Another tip here… make sure you bring your 4 year old muscle in here to do the heavy work, like mixing the batter. Seriously, my daughter loves this stuff and she does a pretty amazing job! I can sit back and have a couple sips of coffee while she stirs happily away! 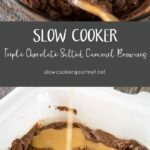 This recipe is designed for a casserole style slow cooker. I cooked them on high for 3 hours.